The Vice-President and Ruler of Dubai, His Highness Sheikh Mohammad bin Rashid Al Maktoum, received the Prime Minister of Pakistan Imran Khan this evening and his associated designation, presently visiting the country. In this meeting the leaders of both countries will exchange their views and discuss the issues with common interest, this discussion and meeting will be held at Za’abeel Palace, addressed in the direction of growing friendly collaboration with two countries. Sheikh Mohammad welcome the Prime Minister of Pakistan, greets him showcased the UAE and Pakistan’s brotherly bound and long trade history and record. The Prime Minister of Pakistan show his desire and express his ideas about the strong relationship of both countries at the good tourist level and more and advance level the long-term communication from both sides. In the meeting Sheikh Ahmed bin Saeed Al Maktoum, Chairman of Dubai Civil Aviation Authority and Chairman and Chief Executive of Emirates Airlines and Group, Sheikh Mansoor bin Mohammed bin Rashid Al Maktoum, Reem bint Ibrahim Al Hashemi, Minister of State, Khalifa Saeed Sulaiman, Director-General of the Dubai Protocol and Hospitality Department, and Hammad Al Zaabi, UAE Ambassador to Pakistan. The Pakistan designation going to attend the meeting with the Foreign Minister Makhtoum Shah Mahmood Qureshi, Minister of Finance Asad Umar, Minister of Petroleum Ghulam Sarwar Khan, and Minister of Energy Omar Ayub Khan with Pakistan Ambassador to the UAE, Moazzam Ahmed Khan with the number of Pakistani senior officers. 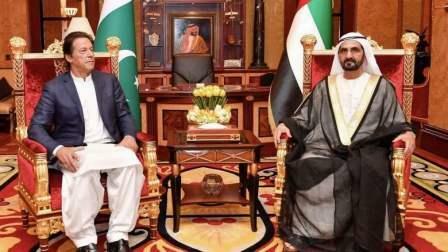 This is the second meeting of Imran Khan with Sheikh Mohammed which early began on Sunday. Khan received by the His Highness Sheikh Mohammed, Crown Prince of Abu Dhabi and Deputy Supreme Commander of the UAE Armed Forces, at the Presidential Palace in Abu Dhabi.